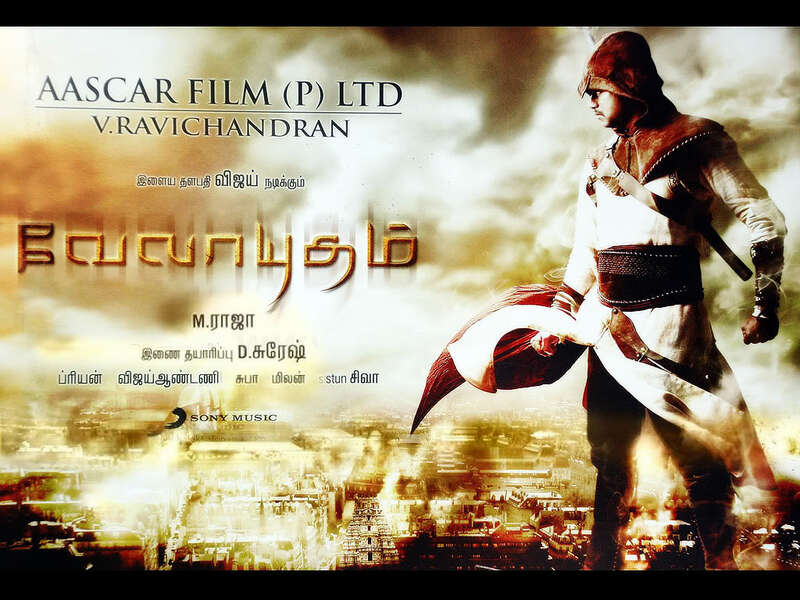 Velayudham is the most entertaining film I saw at the cinema this Diwali and despite the lack of subtitles (and the presence of Hansika) it’s the film I enjoyed the most. It’s a full out masala experience and has pretty much everything; sword fights against machete and axe wielding rowdies, bomb blasts, shootouts, terrorists, a wedding and a funeral, trains, helicopters, horse and car chases. Plus 2 heroines and a plethora of assorted and seemingly never ending supply of villains. M. Raja has added every possible ingredient and stirred well to make a fairly typical but very watchable movie. The film starts on a serious note with a group of young journalists discovering a crime ring in Chennai. Two of the three fail to escape and are killed by the criminals, but Bharathi (Genelia D’Souza) manages to get away despite being knifed and thrown into the river. Fate, or possibly karma takes a hand and the gang end up dead by terminal stupidity. Witnessing their final moments, Bharathi writes a statement of vengeance on behalf of a character she makes up on the spur of the moment. She signs this statement Velayudhan and leaves it by the bodies. I’m not sure what her reasoning was and perhaps the statement itself made it clear, but since I didn’t understand the dialogue I decided she wanted to let the villains know that they didn’t always have everything their own way. And perhaps the idea was to spark a little fear too. It turns out that there is a real life Velayudhan (Vijay) – although he’s definitely not a hero. Vel is an accident prone milk man who causes total havoc in his local village. However his heart is in the right place and he is devoted to his equally scatty sister Kaveri (Saranya Mohan). Vel in turn is adored by his cousin Vaidehi (Hansika Motwani) who is determined that he won’t escape her plans for marriage. Vel’s happy go lucky nature and habit of helping people stands him in good stead as he manages to foil a number of terrorist attacks in Chennai by pure chance. In the course of one such attack he is befriended by Speedu (Santhanam) who is a petty thief and hangs around Vel in the hope of stealing his money. When Vel ‘borrows’ a costume from a jewellery exhibition and chases a gang of thieves on horseback his picture makes it onto the local media and it becomes the iconic image of Velayudhan for the public. In true super hero style he is adopted as their saviour by the locals and they call for him whenever there is a problem. Vel initially doesn’t want to have anything to do with ’Velayudhan – crime fighter’ but eventually events conspire to make him take the on the role. The chief minister is backing the terrorists and they have an intricate and rather unlikely plot to cause a major disaster involving a train and a chemical plant. Velayudhan has to save the day, which of course he does with plenty of style and panache. There is even a Salman Khanesque moment where Vijay loses his shirt during one of the fight scenes which was appreciated by the audience! Velayudhan switches between the serious theme of terrorism, over the top action and comedy but somehow it manages to make it all work. The scenes with Bharathi and the various criminal activities she uncovers are powerful and even moving so that once or twice the switch back to comedy with Vel feels a little jarring. However both Vijay and Genelia are excellent and their scenes together as Bharathi tries to convince Vel to take up the super hero role are the best in the film. 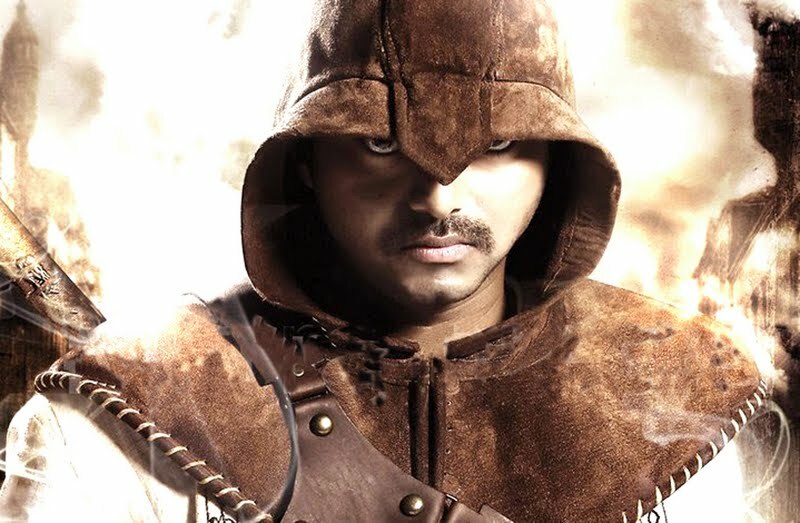 The action scenes with Vijay are well choreographed if somewhat fantastical but I have to admit I prefer the action with Bharathi in the beginning as she tried to escape the criminal gang. This is more realistic and throughout Genelia does a good job with her action scenes. It’s always good to have a heroine who does more than shriek when there is trouble, and Bharathi is daring and brave even if not particularly good at spotting potential danger. Although some of the comedy comes from Vel, his sister and his cousin, Santhanam as the opportunistic Speed is the main focus for the laughs and he does a fantastic job yet again. I found him funny just from his expressions alone since I couldn’t understand most of the dialogue and in general the physical comedy worked well. R. Pandiaraajan has a small comedic role as the police inspector and M. S. Bhaskar, the other comedy stalwart pops up in the village scenes giving plenty of laughs to balance out the action. Although sometimes the action is pretty funny too. Saranya seems good as Vel’s sister but she doesn’t have a large role to play and without understanding the dialogue I missed a lot of the interaction between brother and sister. Hansika thankfully doesn’t get much screen time either. So far I haven’t liked her in any film, and although I was willing to give her another go, she really doesn’t impress here at all. In particular she cannot dance at all and manages to make Genelia look amazing by comparison. She is stilted and looks awkward in most of her scenes, although there are a few moments towards the end where she does manage to show a little more life. I don’t think the wardrobe team like her much either as she has some very odd outfits in the songs too. The music by Vijay Anthony is generally good and the songs fit into the film reasonably well, but work best when Vijay is dancing showcasing his talents alone. A song with Hansika just looks terrible and one with the two heroines dancing with Vijay is spoiled by some very strange outfit choices. It’s Vijay’s film all the way and he delivers as an action hero although Genelia does give him some strong competition and her performance is very impressive. The film does start to drag a little towards the end where the plot becomes too focused on action sequences and loses touch with reality but it’s still a fun watch. Worth seeing on the big screen for Vijay fans and anyone who likes action packed mass masala that doesn’t require too much thought. This entry was posted in Kollywood and tagged Adventures without subtitles, Genelia, Hansika Motwani, Kollywood, M. Raja, M. S. Bhaskar, R. Pandiaraajan, Santhanam, Saranya Mohan, Tamil, Velayudhan, Vijay, Vijay Anthony. Bookmark the permalink. BUT RAJA HAS PENNED A WHOLE NEW SCREENPLAY TO THE MAIN CRUX OF THE STORY.